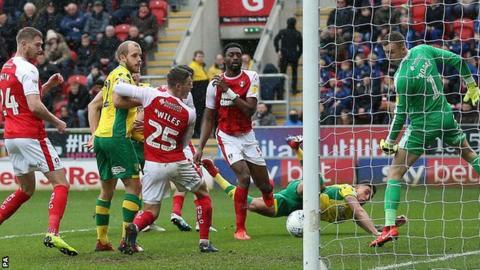 Norwich City extended their gap at the top of the Championship to four points with a hard-fought victory at relegation-threatened Rotherham United. The hosts impressed in the first half but fell behind when Kenny McLean hooked beyond onrushing Millers keeper Marek Rodak after a well-timed run. Defender-turned-midfielder Semi Ajayi levelled for Rotherham, turning on the edge of the box and finding the bottom corner for his sixth goal in five games. But Scotland midfielder McLean turned provider to seal it for Norwich, his corner headed back across goal and in by centre-back Ben Godfrey. A sixth win in a row moves Daniel Farke's side five points clear of third-placed Leeds United, who were beaten by fellow title contenders Sheffield United earlier on Saturday. Jerry Yates came closest to a second equaliser for the Yorkshire side but poked wide with his first touch after coming on, meaning Paul Warne's men stay 22nd and are now a point from safety despite only a second defeat in nine. In-form Norwich playmaker Emi Buendia had an effort cleared off the line as the visitors pushed for a third, but in the end they were content to see out the result. While the Canaries were unchanged for a sixth game running, Rotherham were without suspended pair Joe Mattock and Will Vaulks, as well as Ryan Williams - who withdrew after his girlfriend went into labour - leaving the Millers with six substitutes. However, the home side gave as good as they got in the first half, Michael Smith heading their best chance off target, while Ajayi's purple patch in front of goal will give them hope in the run-in. ​"Going a goal down before half-time, when we played well, was a bit of a hammer blow.​ It was disappointing to concede a set-piece. We should mark better than that, it's inexcusable. Overall the lads were virtually blemish-free." Match ends, Rotherham United 1, Norwich City 2. Second Half ends, Rotherham United 1, Norwich City 2. Corner, Norwich City. Conceded by Jon Taylor. Corner, Rotherham United. Conceded by Timm Klose. Attempt missed. Tom Trybull (Norwich City) right footed shot from very close range misses to the left. Assisted by Emiliano Buendía with a cross following a set piece situation. Jerry Yates (Rotherham United) wins a free kick in the defensive half. Attempt blocked. Emiliano Buendía (Norwich City) right footed shot from the centre of the box is blocked. Assisted by Teemu Pukki. Substitution, Rotherham United. Jerry Yates replaces Richard Wood. Attempt saved. Onel Hernández (Norwich City) right footed shot from the centre of the box is saved in the centre of the goal. Assisted by Emiliano Buendía. Billy Jones (Rotherham United) wins a free kick on the left wing. Attempt saved. Teemu Pukki (Norwich City) right footed shot from the centre of the box is saved in the centre of the goal. Assisted by Marco Stiepermann. Attempt missed. Ben Wiles (Rotherham United) right footed shot from outside the box is close, but misses to the right. Assisted by Michael Smith. Attempt missed. Kenny McLean (Norwich City) left footed shot from the left side of the six yard box is close, but misses to the right. Assisted by Emiliano Buendía with a cross following a corner. Corner, Norwich City. Conceded by Zak Vyner. Attempt blocked. Michael Ihiekwe (Rotherham United) header from the centre of the box is blocked. Assisted by Joe Newell with a cross. Corner, Rotherham United. Conceded by Maximillian Aarons. Offside, Rotherham United. Ben Wiles tries a through ball, but Richard Wood is caught offside. Corner, Rotherham United. Conceded by Christoph Zimmermann.